Magnetized blocks bring a new dimension of play to a classic toy, with a mission that has transformed an entire Honduran community. Handcrafted and eco-friendly, this set of colorful beechwood blocks has interesting shapes that repel and attract one another. The Honduran community that makes them benefits with fair wages, investments in education, and 100 trees planted for every tree used in production. Dimensions: 10.38" x 8" x 1.94"
Sometimes you shouldn’t mess with a classic. But in the case of Tegu, they took a classic toy to a far greater place. These sustainable wooden blocks have an ingenious magnetic design and a social mission that has transformed a Honduran community. The smooth beechwood shapes let kids experiment with the magnetic push and pull. 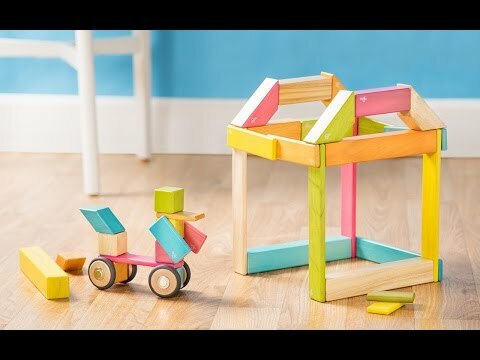 There are endless, wobble-free building possibilities. Brothers Chris and Will Haughey started their business to better the impoverished Tegucigalpa community—and named their company after it. Workers earn a living wage, but more importantly they get help with long-term career growth and development. Tegu’s commitment extends to the community—including a partnership with a local school to aid at-risk kids. And, to the environment—Tegu plants 100 trees for each one used to build their blocks. The Grommet became Tegu's first online partner back in 2009, when Chris and Will’s office was crowded inside a house. It’s wonderful for us to see their continued growth. 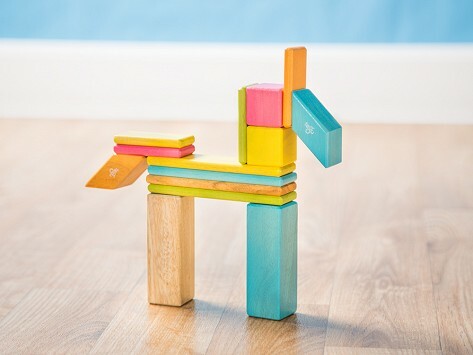 These innovative toys are changing the world, one block at a time.